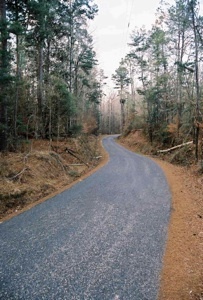 A 5.56 mile section of the River Road in Lawrence County from Highway 43 to Conerly Road has been listed on the National Register of Historic Places. On the recommendation of the Mississippi Historic Preservation Professional Review Board, the Department of the Interior approved the addition of the River Road Historic District on March 21, 2011. The River Road Historic District includes the China Lee community, located at the northern end of the district, and the White Sand Creek Bridge, located to the south. The China Lee community grew up around the founding of the China Lee Missionary Church in 1874. Today one hundred-fifty people live in the community. 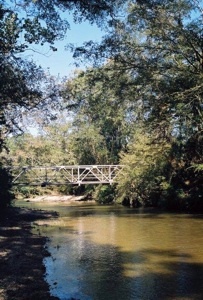 Built in 1913 the White Sands Creek Bridge is one of three historic iron bridges in Lawrence County and is a designated Mississippi Landmark. One noteworthy landowner along the River Road was Stephen Arnold Douglas, the Illinois Senator known for his 1858 debates with Abraham Lincoln. Douglas received the plantation from his father-in-law Colonel Robert Martin. Although the road was eventually paved with asphalt, this remaining portion of the road and surrounding landscape are largely unchanged and recall those pioneer years. National Register listing does not restrict a private owner's use of the property, unless development of the property involves federal funding, federal rehabilitation tax credits, or participation in some other federal program. There are no requirements for public accessibility, and information about sensitive sites can be restricted from the public. The Department of Archives and History is the official State Historic Preservation Office in Mississippi and handles all requests for National Register information and assistance. Congress established the National Register of Historic Places in 1966 as a list of federally recognized properties especially worthy of protection and preservation. Mississippi has more than 1,200 National Register properties, including archaeological sites, battlefields, bridges, buildings, cemeteries, forts, houses, and historic districts. For more information call 601-576-6940 or see the MDAH Web site, mdah.state.ms.us. 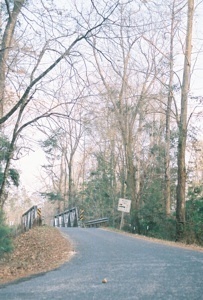 Cutline for both pictures: View of the White Sands Creek Bridge at the south end of the River Road Historic District. The bridge is one of three historic iron bridges in Lawrence County and is a designated Mississippi Landmark.